Single-shoulder dresses and tops are a significant style trend for the summer to come. This is an eyecatching, dramatic look—-but if you’re not convinced about this kind of exposure for day, here’s an idea. Take the inherent dynamism of a diagonal slash and shift it down, via a tunic with a strongly slanting hem. It will instantly convert a workaday top into something rather more interesting. How to do it? Either knot at one hip, or go the extra mile and cut a past-it long top (or mini) to shape, hemming the raw edge down underneath. Knotting is easier, cutting and sewing will look less beachy. Pictured here is a girl-on-the-street showing just how fantastic a look this can be. 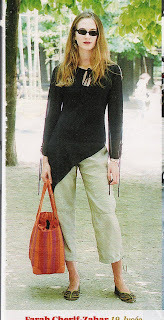 Check out the lovely proportions of top/capris/flats, the structural tote in a punchy color, the cool sunnies, and the slash of red at her lips. It’s such a simple look, but how chic, all the more so because it looks effortless.